Chiropractic is in My Blood… Literally! We look forward to meeting you and personally discussing your specific health challenges. I hurt my back while throwing the hammer for my college track and field team in the late 80’s. At the time I was studying to become a physical therapist. But after P.T. failed to offer me significant relief, a friend referred me to his chiropractor. Dr. Darlene took the time to explain what was wrong and how she was going to help me. Coming from a family of Engineers, the X-rays, angles and mechanics all made perfect sense. I recovered very quickly, and shortly thereafter changed my focus to becoming a chiropractor. Colene’s father was a chiropractor and she had been adjusted her whole life and had “worked” in her father’s clinic since she was five years old. 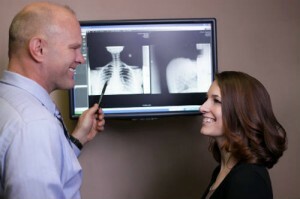 She knew very early on that she would follow in her dad’s footsteps to become a chiropractor. The Most Memorable Time for Both of Us Was When We Actually Began Adjusting. Colene and I both attended the National College of Chiropractic which is where we met. We both felt that it was the most up-to-date at the time and that it would provide us with the best state-of-the-art educational experience. The most memorable time for both of us was when we actually began adjusting. Of course we were all each others lab rats, but that was when form finally morphed into function. Where all the science and classes transformed into tangible and tactile application. Wrapping your hands around someone’s neck for the first time, instead of a book for a change, was rather… humbling. Colene and I have been married for 16 years. We have a young son and we are all very close. We spend most of our free time roaming around our farm, making campfires, fishing, and gardening. My son and I are beekeepers… he began at the age of five. We are avid tennis players and have competed in racquetball for many years. Colene is an excellent cook, which works out quite well, because my son and I are excellent eaters! We live a very simple and quiet life away from the office… and we love it. I learned from a very wise man years ago that you should work to be healthier than your healthiest patient. Yes… we walk the talk. Colene, my son and I get adjusted biweekly and embark in HDT (High Density Training) several times a week. We walk the dog, jog and hit a heavy bag regularly. We garden and freeze a lot of our food, mostly organic and we grow our own Shiitaki mushrooms. We are hopelessly devoted to Standard Process whole food supplements and my son has a tablespoon of Blackstrap Molasses every morning just like his mom did when she was a little girl. Our friends think we’re a little weird because we are connisseurs not of fine wine, but of sparkling water. We also harvest gallons of raw honey. All these things boost an incredibly high level of natural immunity. Flu shots?…Who needs ‘em! Thanks for visiting our site. We look forward to meeting you and personally discussing your specific health challenges. Give us a call so we can get started.